Entheology is a term I invented to describe the theology of entheogens and have since devoted much of my time exploring this topic. We're simply doing our small part to preserve and to promote the sacred knowledge that is being lost to history, both consciously and unconsciously. We continue to build a carefully-selected database of articles specifically related to entheogens, religion, ethnobotanicals, shamanic cultures and the politics that go with it. We also offer concise and unique information for any curious modern-day spiritual explorer, including an RSS feed below, so you can be automatically notified of new articles when they're posted. Please read about the new focus under the "ABOUT US > Who We Are" tab on our completely re-made site. 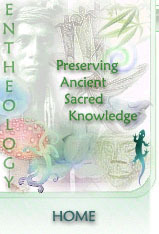 VIEW THE NEW ENTHEOLOGY - A LABOR OF LOVE. Find Salvia divinorum at www.salvia-divinorum.com. | Find Kratom at www.kratomshop.com.